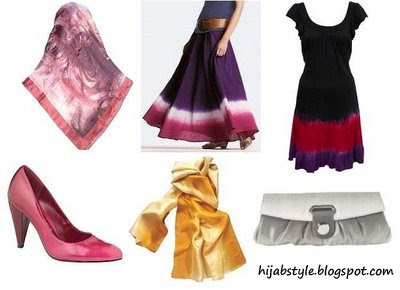 Square scarf £6.36, Simply Islam; crinkle maxi skirt £25, Littlewoods Direct; dress £16, Miss Selfridge; patent court £20, New Look; silk scarf £12.35, La Redoute; clutch bag £15, Dorothy Perkins. That is an absolutely gorgeous skirt. I'm a fan of the purse. For a little girl who has difficulty pulling off head to toe ombre this works perfectly. That skirt is just one more reminder of the fact that you can find hijab friendly clothes in Western retailers. I just found some great dip dye patent heels!